Sar-a-Lee bin of advertising buttons. It includes an assortment of more than 125 buttons from the late 1970s. So useful, and a great advertising collectible. 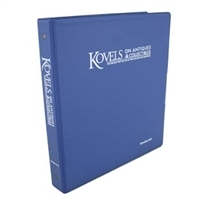 Valued at $5, it’s yours free with the purchase of a Kovels’ 2014 Price Book! 1-1/2" x 1-3/4" diameter.